April Fool's Day! Can you believe it's April already? **Rearrange somebody's drawer or file cabinet in a different order. **Hard boil an egg and place it in the regular egg carton. Or just glue the eggs to the carton. **Replace the sugar with salt or vice versa. ** Tape down the ball at the bottom of someone's mouse (works only on a scroll mouse). ** Ask your friends, colleagues and siblings to perform particular actions together at the same pre-planned time like dropping pencils, tying shoelaces, drinking water etc. **Tape magnets to the bottom of an empty coffee cup, and attach it to the top of your car. Laugh at all the people who frantically try to get your attention as you drive by. **Bring someone a box of stale donuts/bagels. 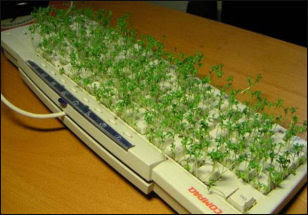 Love the keyboard--how did they do that? This is the first post that I've seen today that had anything to do with April Fools Day... and I LOVE it!! I've been trying to think of some good ideas to use today (besides, hey i think you have a flat tire) but the one about the cup on the car is perfect. Love it, Love it, Love it! LOL! 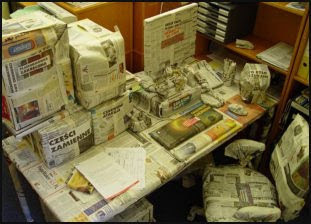 I've done the wrap-everything-on-the-desk thing before, but not nearly so well! I was going to do some things....switch the cereal, write frantic notes on the TP. I've been gone all day. Maybe that's my big joke...I'm NOT going to FOOL anyone. haha. Or....I will just do it tomorrow. haha. Great ideas -- too late in the day for me. But, may still have a chance to do something, later on. Have a great April. I love april fools day! I never thought about gluing eggs to the carton...that's a good one. I think I'll go be nice to Husband...he'll really wonder what is up. 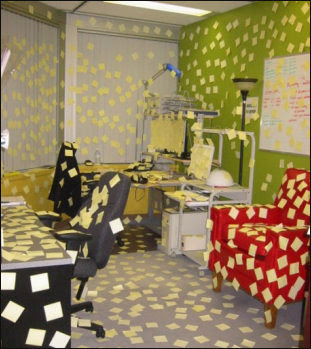 I am not into pranks! I do like the examples!